As an Ohio resident, you know winter can be the worst time for your garage doors to stop working. Action Door, located in Cleveland, Ohio and the nearby areas in Northeast Ohio are the experts in how to prioritize your garage door repairs before the winter months. Before the cold winter weather hits, many of us begin to look at our garage door repairs. It’s no fun when your garage door bites the dust. I mean, who likes getting out of their car to open and close a garage door? No one does. Like everything else, you’ll know when to repair your garage door, because it will start making noises or acting up. Before giving someone a call, here’s how you can access the problem for yourself. Do your rollers and tracks need cleaned? Give all rollers, hinges, tracks and latches a good brushing and add some lubricant. Wipe everything clean and then add some oil. If they still aren’t working, try adding kerosene. You can remove the rust with steel wool. Does your garage door have weather-stripping? You can check this by looking along the sides of the door. If it’s jamming, consider replacing it. If it’s a wooden garage door, make sure it’s properly sealed. Is your garage door noisy? A noisy garage door is annoying for someone who sleeps above or next to it. Lucky for those with this problem, it’s an easy garage door repair by merely replacing a few parts. This problem is typically caused by old, metal rollers that make a lot of noise. Is the problem with your garage door opener? Don’t wait for your garage door to stop working properly before taking action. It is important to do routine garage door maintenance and fix any problems as they come up. If you wait for the situation to become worse, you could cause a safety problem. Poorly adjusted garage doors or poorly installed openers can apply deadly force when the door closes. Therefore, it could cause you or a loved one to get a serious injury. Action Door has been in business for over 50 years and can help those looking for Northeast Ohio garage door repair, such as Cleveland, Akron, Canton, Lakewood, Cuyahoga Falls, Euclid, Mentor, Brunswick and Euclid. Our garage door repairs are for those in commercial and residential. We repair torsion springs, door cables, tracks, rollers, door panels and other hardware. 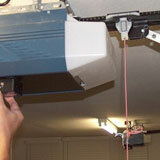 We can help you keep on top of garage door safety as well as eliminate those noisy doors. Don’t take our word for it. Ask your friends and family. We know that we have a good reputation. While the world-wide web is full of companies offering garage door repairs, do your homework. When choosing a garage door repair company, look for experience, accreditation and warranty. You’ll notice that we won the Super Service Angie’s List Award, in the International Door Association and part of the Better Business Bureau. If you need to our assistance, contact us for your free quote today. Fill out a free estimate or contact the Action Door office closest to you for more information.